 = No data reported. 1 Calculated on a per day basis. Notes: In January 2007, oxygenated was combined with conventional gasoline and ultra low sulfur diesel was added. Values shown for the current month are preliminary. Values shown for the previous month may be revised. Source: U.S. Energy Information Administration, Form EIA-782C, "Monthly Report of Prime Supplier Sales of Petroleum Products Sold for Local Consumption." The Prime Supplier Report presents data collected on Form EIA-782C, "Monthly Report of Prime Supplier Sales of Petroleum Products Sold for Local Consumption." These data measure primary petroleum product deliveries into the States where they are locally marketed and consumed. 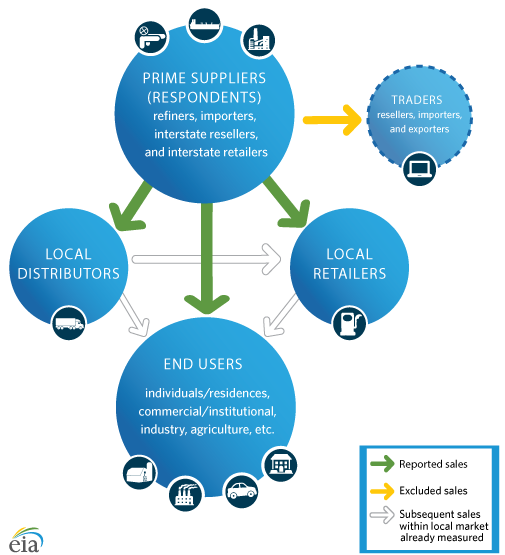 The EIA-782C respondent frame comprises approximately 202 prime suppliers representing producers, importers, and interstate resellers and retailers. Each month, respondents report their aggregated sales volumes (combined wholesale and retail) made during the reference month to local distributors, local retailers, and end users in each state where the product was delivered. To avoid double-counting volumes, respondents are instructed to exclude sales to other prime suppliers and traders. See exclusionary list.